Watch George Clooney's One-Man ER Reunion on Jimmy Kimmel Live! What if you threw a cast reunion for a very popular drama, and only its biggest star showed up? That's exactly what happened on Jimmy Kimmel Live! last night. Usually when any beloved TV show or movie cast gets back together, it's the leading man that doesn't show up. The reverse happened when it came to getting the old ER gang back together. George Clooney was game to get his Dr. Doug Ross back on. But no one else could make it! George Clooney donned his signature scrubs that made him famous. He played Dr. Ross on the first five seasons of ER, and after a long career of struggling to get a foothold in Hollywood, he went onto become a Hollywood legend. In the so-called ER reunion skit, Dr. Ross arrives to help out patient Jimmy Kimmel, who has lost a lot of blood and requires immediate medical attention. George Clooney needs a scalpel, STAT. But no one brings it. 'Why not?' He asks. And this is when Jimmy Kimmel confesses that his planned ER reunion is going to be a one-man show. He tells George Clooney the following. "I know I'm supposed to be under, but the reason nobody's bringing you a scalpel is because this was kind of a last-minute thing and we had some trouble getting the whole cast of ER." George Clooney and Jimmy Kimmel run down the laundry list of big names who have played members of the ER staff over the 15 seasons that it was on the air. Julianna Margulies was too busy shooting The Good Wife to show up. Noah Wyle wanted to be there, but he had Taco Tuesday with his family. And Eriq La Salle? Jury Duty, of course. Said Jimmy Kimmel. "I'm sorry. We really probably shouldn't have even done this. If you want to cancel..."
As you'll see in the video below, there is no way George Clooney cancels anything. Not even a one-man ER reunion. That's when Jimmy Kimmel brought in a surprise guest. No, it's not another ER alum, but House star Hugh Laurie, who co-starred this past summer in Tomorrowland with George Clooney. Together, the two big stars go onto check Jimmy Kimmel's groin area, and joke about how they don't do 'microsurgery'. 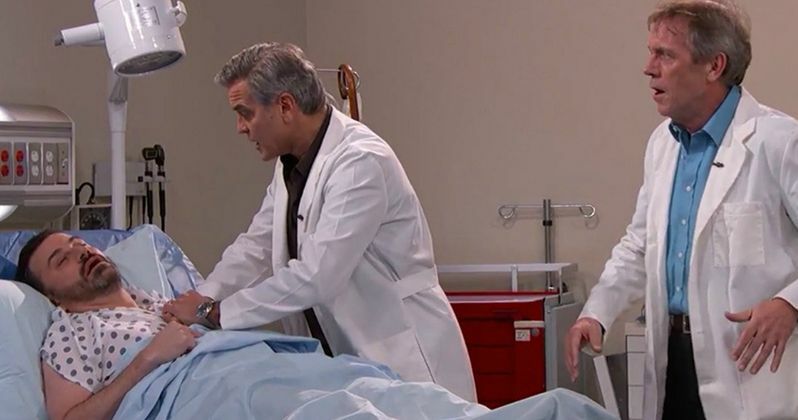 As the skit goes on, George Clooney quizzes Jimmy Kimmel on the whereabouts of some more obscure ER cast members. Some couldn't get an Uber, some are at Soul Cycle. When it becomes clear that the talk show host needs CPR, only one thing will save him. And that's a little hip-hop. Watch as George Clooney saves his patient with his keen rap skills. It's all in the video below. George Clooney Returning to ER?